ShammingSituation: Book Review of The Benefits of Failing Successfully: 10 Hidden Benefits of Making Mistakes And Failing by Dr Jagdish Chaturvedi. 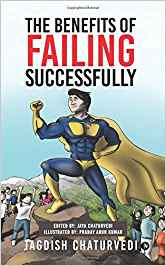 Book Review of The Benefits of Failing Successfully: 10 Hidden Benefits of Making Mistakes And Failing by Dr Jagdish Chaturvedi. We live in a world where people boast about their success and doesn’t even share a bit of their failures that they have seen or faced while reaching where they are today, and that is what we get to know ( their success stories ) in those books that they write in the name of memoir or Autobiography. Kudos to the author for being brave and writing about his failures in such an amazing and humorous way that you could actually relate to it. Well to start of with the cover i actually liked it that much that i picked up only because of its bright colors and the illustrations itself caught my attention. I read the blurb and within a minute i was reading this book with rapt attention. I got the best of lines of wisdom by the one liners that the author has shared as 1-2 liners, it is par excellence. The illustrations goes well with the context and the best part of this book is, this book can act as an inspiration and can be read by all the age groups. This book is an ode by the author to all those people who are not afraid of failing and are proud to fall only to rise and soar higher, all over again. This book can actually be considered as one Real ‘self help’ book. You can read it as many times as you want and you won’t get bored and this is what the beauty of this book is. No grammatical errors, no errors. Go for it without even looking at the price.